"Sea Nav Electronics Company has installed all of my electronic equipment over the last 10 years. During this time, I have owned a 37' Sea Ray Sundancer, a 23' Edgewater and now a 31' Edgewater center console. 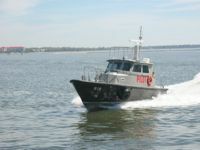 All of the boats have had Raytheon navigational, communication and radar equipment, the most updated models at the time of purchase. I use my boats for both business and pleasure and the equipment has to be working at all times. They are used 12 months a year in most all weather conditions and it is crucial that this equipment works up to its potential. Cam Dawson has always been available and there for me to insure things have worked perfectly. I have been extremely satisfied with the equipment and the service." "Cam's the first person we call when we need electronics installed!" "The Northeast Marine Pilots have used Seanav Electronics to troubleshoot and repair the electronics on our boats in the Cape Cod Canal. They have responded to our repair requests and successfully completed repairs in a timely and efficient manner. We have found Seanav electronics to be reliable and capable"
"Cam Dawson and his crew have done a spectacular job over the years providing my boats with all my electronics needs. SeaNav has installed Radars, GPS's, Cell Phone Boosters, FM Stereos and many other items for me in past years. Each job has been done, with nothing compromised. The work is always done with the highest level of quality in installation. Cam's workmanship is done with pride and often the wiring harnesses are better organized and more tidy than what a new boat provides. Whether you're looking for expert advice on what to purchase, or looking for a quality installation, I would clearly put Sea Nav Electronics above all the others." SeaNav electronics has installed & Maintaned my electronics on four of my personal boats over the past two years. Cam and his crew are true professionals in every respect having installed a whole Garmin 8000 series package on my 38 Bertram and total rewire with spectacular LED accent lights through out my boat, New electronics on my 1964 23 Bertram and has maintained the electronics on my 38 Fountain & 25 Dusky. Response time is very important for us summer boaters and when you call SeaNav electronics for servise or new electronics his company will respond immediately and comunicate with you in a timely maner.